Fraud case • St. George man ran legitimate business, attorney says. 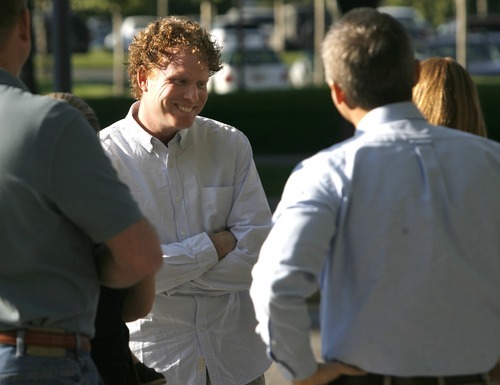 Rick Egan | The Salt Lake Tribune Jeremy Johnson smiles as he is greeted by relatives at his release on bail from the federal courthouse in Salt Lake City, Thursday, Sept. 15, 2011. 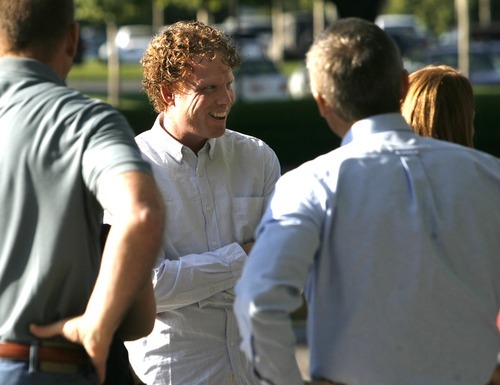 Rick Egan | Tribune file photo Jeremy Johnson is greeted by relatives after leaving the federal courthouse in Salt Lake City in 2011. 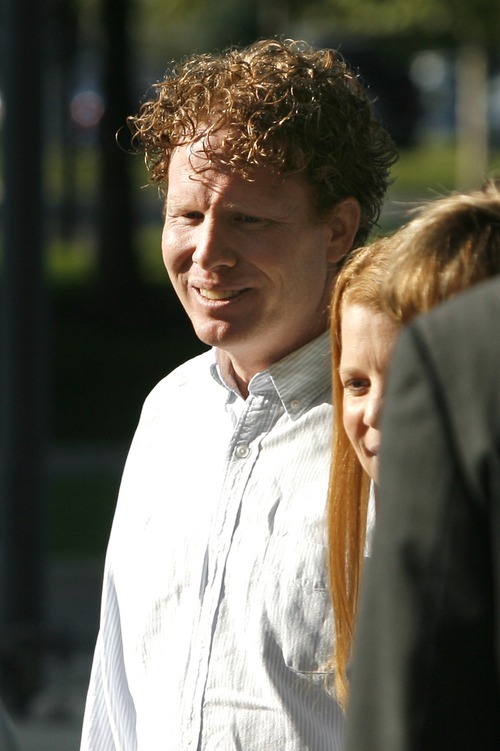 Rick Egan | The Salt Lake Tribune file photo Jeremy Johnson smiles as he is greeted by relatives and is released on bail from the federal courthouse in Salt Lake City in September. Johnson was arrested over the weekend over an unpaid debt to a Las Vegas casino. 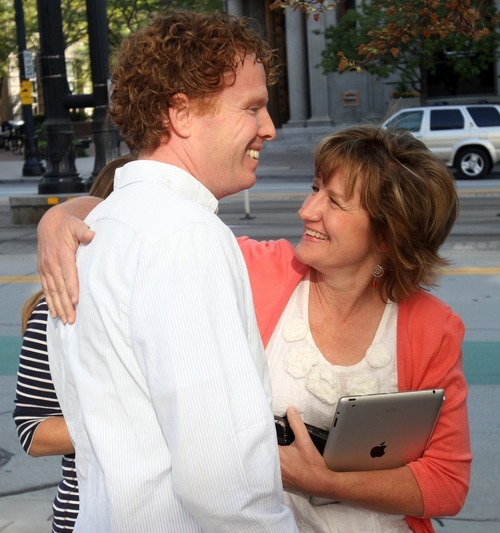 Rick Egan | The Salt Lake Tribune Jeremy Johnson gets a hug from his aunt, Marianne Ruben, as he leaves the federal courthouse in Salt Lake City, Thursday, Sept. 15, 2011. 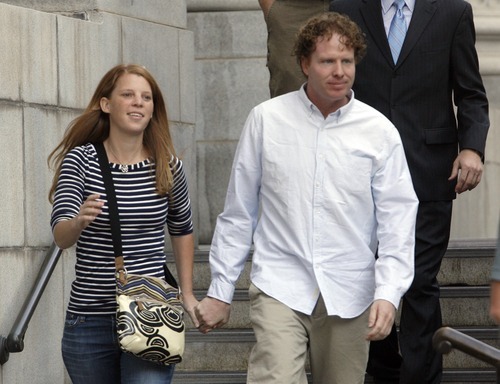 Tribune file photo The FTC has asked a judge presiding over its lawsuit against Jeremy Johnson to amend it to include among others Johnson's wife, Sharla, seen with him after a court hearing last fall. After posting nearly $2.8 million bail on a mail fraud charge, St. George businessman Jeremy Johnson walked out of the Frank E. Moss U.S. Courthouse in Salt Lake City on Thursday morning after 96 days in jail. Holding the hand of wife Sharla, Johnson smiled as he left the courthouse and hugged relatives, freed from jail for the first time since his June 11 arrest in Phoenix. "He&apos;s happy to be out, excited, and he&apos;s going to spend some time with his family," Johnson&apos;s attorney, Nathan Crane, said in cutting off questions to Johnson. Crane said he and Johnson would now prepare to battle federal prosecutors over the mail fraud charge and others expected to be handed up by a federal grand jury in connection with Johnson&apos;s operation of iWorks, an online marketing company that took in millions of dollars, allegedly in unauthorized charges on consumers&apos; credit and debit cards. "We&apos;re excited about going to trial," Crane said. "Jeremy has run a legitimate business, and we look forward to our day in court." U.S. Magistrate David Nuffer signed an order Wednesday that freed Johnson on bail until his trial. Nuffer&apos;s action came after Johnson&apos;s relatives and friends put up equity in property and an annuity to meet the demands of the U.S. attorney&apos;s office for a substantial bail. He also must wear a GPS ankle bracelet that constantly monitors his whereabouts. Johnson was in jail for 96 days, since his arrest at Phoenix Sky Harbor International Airport before he could board a flight to Costa Rica, where his attorney said he was trying to set up a helicopter tourism company. That came after Johnson had shut down his iWorks business late last year as it was being investigated by the Federal Trade Commission for possible fraud. An IRS agent who arrested Johnson said the agency had been told Johnson intended to stay in Costa Rica for a substantial period of time, though the agent also said he didn&apos;t think Johnson was fleeing the country. Johnson&apos;s attorneys say he would have remained in the U.S. had he known he would be charged. U.S. Justice Department trial attorney Brent Ward has said he expects a new indictment that will add more charges to the case against Johnson, who also is known in Utah for his philanthropic efforts. In December, the Federal Trade Commission sued Johnson, iWorks, Johnson&apos;s partners and others, accusing them of running a massive online fraud operation. iWorks-related websites touted products for "make-money schemes," "stay-healthy programs" and information about government and private grants, which purportedly could be used by consumers to pay for personal expenses. But some of those who gave credit or debit card numbers to cover a minimal handling charge, usually $1.99, also were charged a one-time fee of $189, then monthly fees of $59.95, according to the suit. From 2006 to late 2010, iWorks took in $350 million from hundreds of thousands of customers before Johnson shut it down in late 2010, and he received about $48 million from the business, according to the FTC. Nuffer previously turned down $1 million in bail for Johnson after a former business partner testified Johnson showed him safes full of cash, gold and silver, and said he had money stashed on mountaintops and in lakes. But Crane worked out the new amount with Ward.